This was so far the best one-sided match of the championship where Passakorn made big breaks in all four frames. He made clearance of 57, 44, another clearance of 66 and then 43 in last frame to keep Dilip Kumar on the score of 0, 2, 0 and 16. Another Thai player Suckakree Poomjang survived in the deciding frame against Indian player Aayush Kumar 4-3. At one stage, Suckakree was down 1-3 but then he geared up and won rest of the three frames having decent victory margins to make his place for the Last-32. The last player from Thailand, Thanawat Thirapongpaeboon also reached in the Last-32. He beat Mohamed Ibrahim of Egypt 4-2. 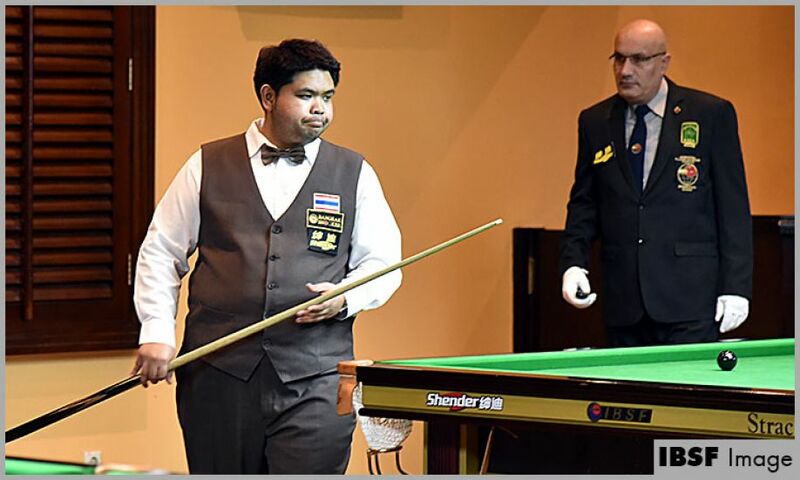 His match swung like a pendulum where they both secured alternate but towards the end Thanawat put extra weight in the deciding frame and won it to secure his berth in Last-32. However, Ibrahim had made break of 73 in fourth frame which is second highest of this competition.